Mural by Peelander-Yellow. Photo courtesy of RESOBOX Gallery. Opening Reception and Live Painting: Friday, August 21 from 7:00 p.m. until 9:00 p.m.
RESOBOX Gallery will turn completely yellow during this exhibition. Japanese artist Peelander-Yellow will paint murals featuring the color yellow on RESOBOX’s walls, tables, chairs, and even the ceiling. During the opening reception, Mr. Yellow will do a live painting of an original piece. There will be small canvases, drumheads, yellow patches, and t-shirts with original works on sale throughout this exhibit. Peelander-Yellow was born in Hyogo, Japan, and attended the Osaka University of Art. He joined the Art Students League of New York shortly after graduating. He’s had many art exhibitions of his work in Osaka; New York; Austin, Texas; Oaxaxa, Mexico. 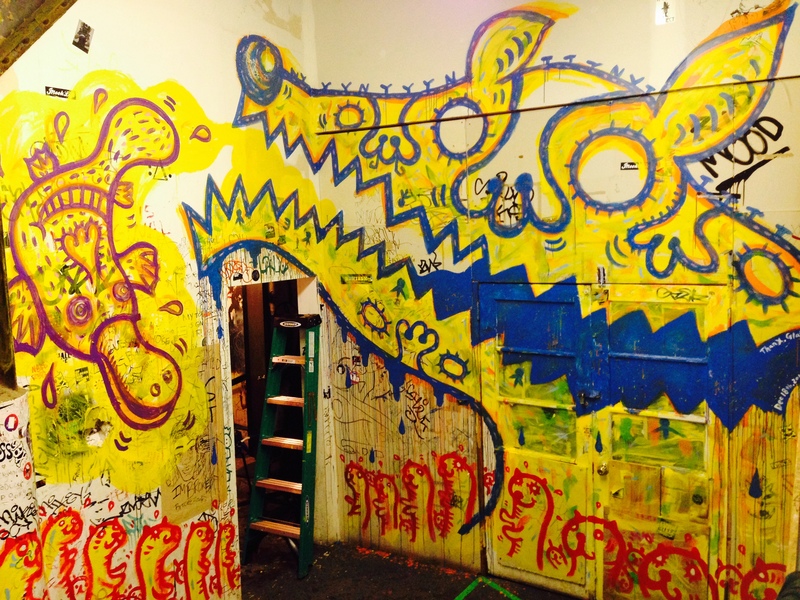 His murals can be seen at various locations of East Side King in Austin, inside Austin’s Facebook Corporate Office, at the Austin and New York JuiceLand locations, and at Dvir Salon in Brooklyn. For more information, please visit RESOBOX’s website. Next Next post: Waku Waku +NYC Japanese Anime Con in Brooklyn NYC!